It’s been only a couple of months since Final Fantasy XIV: Stormblood launched, but for some of us it feels like a lot longer. As good as this expansion is, some of the most anticipated content wasn’t due until the first major patch. Patch 4.1 hasn’t taken any longer than previous major updates—three months or so is the standard window—but for anyone excitedly looking forward to the new Ivalice raid or to buying a house in Shirogane, it’s felt like a lot longer. Titled The Legend Returns, patch 4.1 finally dropped last week, bringing with it a new chapter of the main scenario, a couple of new dungeons, access to the Shirogane housing area (for those few people lucky enough to get a plot), some quality-of-life improvements, and a wealth of other little tweaks and updates. Sadly, some of the more interesting planned additions didn’t make the cut—chiefly, a new Bard action that lets you play an instrument in game, a new “Ultimate” difficulty trial, and a mech-focused PVP mode. We won’t see these for another few weeks. The biggest draw in The Legend Returns is The Royal City of Rabanastre, the first part of the Return to Ivalice raid. As the name suggests, the dungeon sends players off to the ruins of Rabanastre—one of the major cities in Final Fantasy XII—to rescue a lost scholar. Naturally, the journey is a dangerous one, bringing the rescue party into conflict with a handful of unpleasant monsters. The scholar in question, it turns out, is investigating the myth of the War of the Roses (the name given to the war that plays out in Final Fantasy Tactics). To most people in Ivalice, the story is little more than a folktale, but the scholar’s convinced there’s more to it, prompting his reckless adventure into Rabanastre. It’s a premise that effectively links the Ivalice games with Final Fantasy XIV. Ivalice, as at know it, is now an ancient, long-lost kingdom within the world of Final Fantasy XIV. This game is full of nods to other Final Fantasy titles, but the story surrounding Return to Ivalice ties XIV to a handful of other games in a much more meaningful way. The final boss is a highlight, mostly because it becomes more and more like a Benny Hill skit the longer it goes on. The raid itself is hectic fun, in much the same way as the other alliance raids. Each boss brings a wide range of mechanics into play, and they can be confusing to wrap your head around, especially if you go in blind. There’s a lot of room for error, though, so most groups should be able to get through without too many wipes, even if people are learning on the fly. The final boss is a highlight, mostly because it becomes more and more like a Benny Hill skit the longer it goes on. It has a lot of marked AOE attacks in various patterns that have everyone running around like headless chickens. Then, at around 50% health, he starts using an attack that puts a spinning cursor above your head; if you try to move, you move in whatever direction the cursor is facing at the time. This attack is raid-wide and unavoidable, so you get these bizarre, hilarious situations where everyone’s running around in circles trying to dodge AOEs while the spinning cursor keeps interfering with their orientation. It’s fantastic. Also new is The Drowned City of Skalla, a 4-person level 70 dungeon that joins the Expert Roulette. It’s pretty much on par with the other Expert dungeons (Ala Mhigo, Kugane Castle, and Temple of the Fist), but with a higher item level requirement and enemy stats to match that. There’s little in the way of trash, and a decently geared tank can do big pulls without much trouble. For the most part, the bosses use a handful of familiar mechanics: the first boss, Kelpie, has tsunamis and puddle drops; the second boss has adds that you have to burn too stop a big unavoidable attack; and the final boss has untelegraphed attacks and a gaze. They combine these mechanics in interesting ways—like like forcing you to be mindful of puzzle placements so there are safe zones to be pushed around by tsunamis—but there’s nothing that should surprise anyone too much. If you want to know what to expect before you dive into the Drowned City of Skalla, check out my guide. 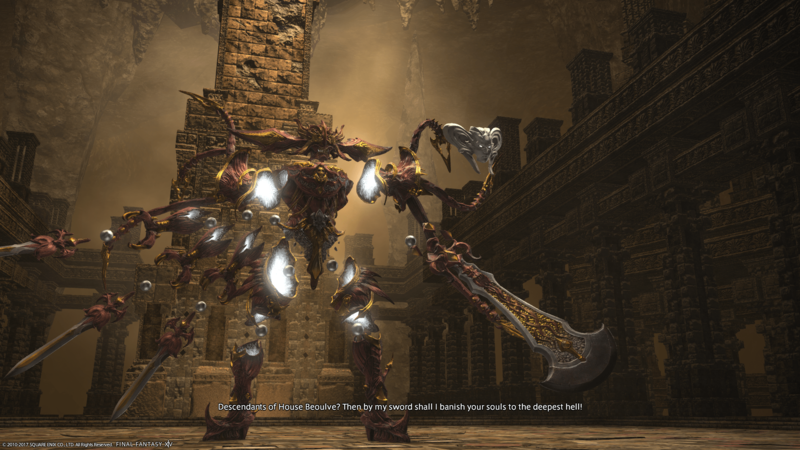 Skalla unlocks as part of the new main story quest, when a member of the Ala Mhigan resistance invites the Warrior of Light on a treasure hunt. Following a string of rumours, the group uncovers the location of a stash of long-lost treasure—as you might have surmised, it’s the drowned city. Building on this premise, the dungeon has the look and feel of a submarine Cave of Wonders, with piles of treasure wrapped around gloomy caves and stalagmites. It’s gorgeous. There’s one more new raid, an extreme version of the Shinryu trial, but I haven’t tried it, so I can’t really comment on it. From watching a few videos, though, it looks intense; I hope I can find some time to join a learning party soon. The main scenario is probably my biggest disappointment with The Legend Returns, being little more than a continuation of the final act of Stormblood. A central part of 4.0’s narrative was Lyse growing into her role as a leader for the Ala Mhigan people, but in 4.1 she’s back to her old unsure self. It’d make sense that she still has some hesitation in some situations—she’s only human, after all—but it feels like the writers have almost retconned a big chunk of her Stormblood arc. The story also sees Nanamo, ruler of Ul’dah, trying to see how she can help the Ala Mhigan refugees. For whatever reason, she decides to consult Lolorito—a merchant leader who tries to overthrow her not that long ago—who convinces her that providing aid to the refugees can also be profitable for Ul’dah. It’s a very weird, neo-liberal turn for a city-state that’s always struck me as a critique of capitalism. Maybe it’s laying the groundwork for some more development later on, but at present it just comes across as an uncritical celebration of neoliberal ideology. The best part of the main scenario in The Legend Returns is the teaser at the end. It’s very funny, and it also paves the way for a return to Othard—the highlight of Stormblood—in patch 4.2. As your expect, patch 4.1 also comes with a raft of balance tweaks, quality of life improvements, and other less content-centric additions. For those lucky enough to get a plot, the patch opened the Shirogane housing area. On my server, every ward—that’s 720 housing plots total—was sold out within minutes. I was lucky enough to get a plot (and my first choice, at that! ), but the whole FFXIV housing situation is a bit grim. Hopefully Square Enix can find a way to make it more accessible. A small change that I nonetheless find very welcome is the ability to have a minion and your chocobo out at the same time. I like collecting minions, but I rarely got a chance to use them previously because I almost always had my chocobo summoned. Now that they’re no longer mutually exclusive, and can actually see and enjoy spending time with my pets while I’m out grinding FATEs or whatever with my birdie. Being able to add friends from other servers to your friend list is very welcome, as is the ability to form 24-alliances with the raid finder. The Alliance Raid roulette, new Kojin beat quests, and M’naago custom deliveries box in existing systems to add more ways to level jobs from 60 to 70. Scholars and Dragoons get some much-needed buffs. You can get a flying couch mount and a koala pet. The list goes on. In short, The Legend Returns is more or less what I expected and hoped for. The developments in the main scenario leave much to be desired, but the story surrounding Return to Ivalice—and the way it brings Ivalice into Final Fantasy XIV canon—is great. The new dungeons are gorgeous and a lot of fun,and the latest batch of quality of life improvements continue to make the passing experience as smooth as possible. Here’s to many Rabanastre runs ahead as I gear up my Red Mage, to hopefully clearing Shinryu EX before too long, and to Final Fantasy XIV’s endless growth and support. Not playing FFXIV yet? If you enjoyed reading this review and plan to buy it, you can support Shindig by using this Play-Asia affiliate link.